After viewing one of WatchMojo.com’s clip on YouTube based on their Top 10 Best Cartoons made by Nickelodeon, I decided to share my personal rankings on the Nickelodeon-produced cartoons I have seen. For those who don’t know, WatchMojo.com is a ranking/review-based website company which posts Top Ten based videos daily on YouTube and sometimes history lessons on certain topics. Categories include Film, TV, Books, Politics, Music, Sport and Video Games. As for Nickelodeon, I’m sure most of you are familiar with Nickelodeon. It is an American TV channel which broadcasts and sometimes produces TV shows aimed for children. I never owned Nickelodeon myself, but I knew some mates who did. And them lot are how I got to know most of the shows I am about to explore through this blog. If there’s one Nicktoon I despise the most, it’s SpongeBob Square Pants. God, this show irritates me! I can’t see anything great about this nicktoon, nor appealing, nor even funny. I don’t even understand the popularity and as Rhett Butler from Gone With The Wind might say, frankly my dears, I don’t give a damn. SpongeBob has one of the most annoying voices in cartoon history. Why did WatchMojo.com have to rank it number 1? Why, WatchMojo? Whyyyyyyyyyyyyyy?! I ain’t bovvered. That’s all I have to say. Next! As a kid, I thought Doug was a rather pleasant viewing. But looking back to it now, I can definitely understand why the Nostalgia Critic hated the show so much. Personally I don’t hate Doug, but I do agree that it is indeed a lame show. It’s bland and forgettable, apart from this particular episode where Doug Funnie purchases some comic book and encounters some hilarious lie-detector, but the comic purchase, we’ve all seen before. Yawn. Actually, there was another episode where he dresses as a superhero called Quail-Man. In fact, they should’ve renamed this show Quail-Man and altered the show’s whole plot, rather than make it about just some high-ish school student who is constantly bullied by some guy walking a cat (don’t make me laugh!). Quail-Man,… something like Batman? Or similar style to Spider-Man? Superman? Condorman? Anything would be awesome compared to how it is now! Before I move on, I also want to add that the title; I’d give it credit for it’s limited use of 4 letters. After all, Jaws was certainly a great title for a summer blockbuster. But the title is just as rubbish as say Madeline or most of the titles given to them shows you get on CBeebies. Some how, when I think of The Wild Thornberrys, I think of Jumanji. Okay, it ain’t based on a magical board game. It’s about a girl who can talk to animals which is unique, but I think I remember seeing that sort of thing elsewhere, like, for instance, er…, The Jungle Book. Yeah, I’d say it’s more comparable to The Jungle Book than it is to Jumanji. And of course, along with the rest of her family, they’re international travellers. Dunno what else to say really. Adventurous, but I can’t remember much about this one. Apparently there was a movie based on the show. I never watched it, but I listened to that Paul Simon song which I have to say has a nice relaxing tone to it. I don’t remember much about The Angry Beavers. But I remember it being broadcast on BBC2. And what I can gather is that it’s about two mentally ill beavers who become bachelors in a forest. And that’s it, about a couple of mentally ill beavers who live a bachelor life in the forest. We’ve all known that cats and dogs are not easy going amongst each other and, of course, conjoined twins are easy to come across but are quite rare. CatDog mixes them two facts together and voila, you get conjoined animals, one half being a cat, the other a dog, both with different personalities, the dog who has a chasing habit which the cat finds very hard to stay out of. CatDog is a Nicktoon which I’d place in the okay pile. What nineties kid could possibly not remember good old Hey Arnold? Well I certainly ain’t that kid. Hey Arnold is about this kid who lives with his grandparents in the Bronx and the show kinda deals with his experiences with the city and various problems he and his mates encounter. Memorable for the city’s atmosphere, certain episodes and of course Helga, who I think is the best character in the show. She constantly bullies Arnold, but has a secret love for him. Kudos for that! And speaking of episodes, I have hilarious memories of ’em; one where Curly lashes out at the school for being rejected as the post-recess ball collector. Another where the school puts on a play based on Romeo & Juliet and all the boys, except Arnold, reject the role of Romeo, because it involves kissing. Lololololololololololol. I used to be rather cynical about Rugrats, but looking back, this was without a doubt a great show. Maybe it was the music, but it actually does fit the atmosphere. However, that’s beside the point. The main focus is the world a group of babies live in and how their communication differs to the older generation of, er, people. Like Hey Arnold, Rugrats contains memorable characters; Tommy, the adventurous one, Chuckie, who’s very much comparable to Milhouse from The Simpsons, Anjelica, Tommy’s older cousin and my favourite one; the one who scares the hell out of the babies. For instance, one episodes depicts her warning them that they’ll transfer into chickens through chicken pox which results in them screaming. Lol. Or what about that episode where she tells Tommy and Chuckie about the time when some kid got washed down a bath plug hole. Again I say lol. Too much to say really. The unforgettable Ren & Stimpy. The Tom & Jerry of the nineties, only a little vulgar. Very explosive, psychological, cringe-worthy, domestically violent. These are the terms that best describe Ren & Stimpy. Imagine getting bashed with irons, you’re eyes popping out so hard they burst and/or turning to pulp and various other actions which would feel so painful in reality. Yet, with all these pieced together, it’s still an awesome and enjoyable experience when it comes to Ren & Stimpy. And Thunderbirds are go! Whilst watching WatchMojo’s clip, I was shocked to discover that Aaahh!!! Real Monsters was not included. How come? This is like the best Nicktoon I have ever seen in my life. When it comes to shows about monsters, this one is so unique. Yet of course, Pixar nicked the idea from Real Monsters and turned it into ‘such a big block-buster’ that was Monsters INC. (sighs) I can’t believe WatchMojo neglected to include this one on the list. Let me just point out I do not hate Monsters INC. I think it’s an okay film. Just not super great. I think Pixar made better films. Okay, back to Nickelodeon’s masterpiece and enough of my moaning, because this is supposed to be a happy occasion when I talk about number 1 spots. For those who don’t know, Aaahh!!! Real Monsters centres on a college of youth-monsters whose missions are to scare the hell out of people as part of their assignments and then return to the school to tell the story. See what I mean by unique? Another thing distinctive about Real Monsters is the design of each monster character, especially Krumm. Oh my god, Krumm is like simply the most unique character that comes into mind when I think of monster designs. The fact that because there are no attachments to hold his eyes, he has to hold his eyes is amazing. And yet, there were some awesome episodes which demonstrate how hard it would be to cope with the ability to hold one’s own eyes. He is joined by Ickis, who appears harmless due to his rabbit-like body but can extend sizes and Oblina a candy cane shaped creature whose speciality is to implant nightmares into humans’ minds. Their lecturer is the Gromble who I have to say is without a doubt a mad professor. Get it? The humour often consists of double meanings and occasional adult jokes (that some younger kids may not get) and of course Krumm’s eyeball gags. The show is occasionally dark, but it’s about scary monsters. What do you expect? Aaahh!!! Real Monsters is one of them shows children would expect to see when it comes to the horror genre. Horrifying moments, unique designs, shadings to depict darkness. I liked it so much better than Paranormal Activity. The strangest thing is, I never knew Real Monsters was a Nicktoon until of course I saw the logo after the closing credits. When I knew the show, it was broadcast early Sunday mornings on Channel 4. Yell at me if you want for placing such an underrated Nicktoon above the hugely popular Ren & Stimpy, but Real Monsters is the Nicktoon that got me the most invested in. I give this Nicktoon a special mention, because I’m not sure I’ve actually seen a full episode of the show in my life. But when I saw the Nostalgia Critic’s review of Nicktoons, Rocko’s Modern Life did look familiar-ish. Voices, great, designs, great, but humour, so-so. I can see where the Critic was coming from when he said about plain ripping-off. So that was my personal ranking of the Nicktoons I watched in my life. 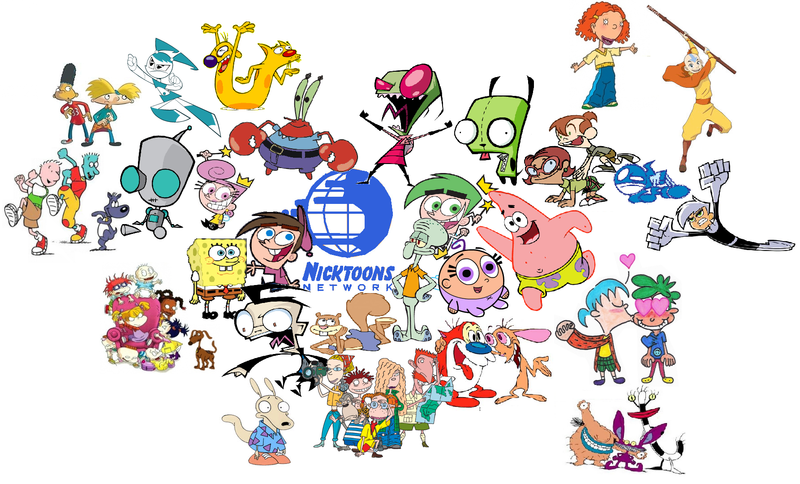 I know I’ve missed out many of the 21st Century Nicktoons, but I didn’t grow up with them. Anyway thank you for your readings. Ni-Nick, Ni-Nick, Nick, Niiiick. Nickelodeoooooooon! When I began development on Placebo, I was in the second half of my first year of my studies for HND Digital Film-Making. Part of our assignment was to form groups with one another and create a short film of six minutes, within three months. This assignment was a follow-up to my previous film, From Grass To Grace, which was produced for a very limited time (only two months and we had the Christmas vacation in-between). Like From Grass To Grace, I did experience what is called ‘Development hell’. But despite that, and compared to other films I worked on during that period, I would personally consider this film my best project. James and Lisa were once a happily married couple, until one day, they experienced a fatal car crash, which killed Lisa. James feels heavily bereaved following the loss of his wife. Later, whilst working, he discovers a special drug advertised on the internet. During my first year of my studies for HND Digital Film-Making, I had recently completed two narrative films, Door and From Grass To Grace. A week after completion of From Grass To Grace, we were provided another assignment which involved production for a narrative film. This film had to run for a maximum of six minutes. The first thing we had to do was to form a group. Originally, we formed as a four piece production group. Matt came up with the idea for the synopsis. The original synopsis not only involved James interacting with his dead wife, but also involved James experiencing financial issues for he is spending his savings on ‘Placebo’ in order to spend more time with Lisa. For a few evenings, I wrote a rough script for the film. Michael wrote another draft which was the same story, but elements differed. For instance, we had not yet decided the character’s names. When I wrote my draft, the characters were originally called George and Sharon. Michael’s named them James and Lisa, the option we eventually chose. The film and title drug was also originally called Magik Memories, but we wanted a more subtle title, hence Placebo. We held discussions with our tutor who felt that to include a large amount of plot points in our film, including the financial issues James faces, was too excessive for a six-minute short film. Therefore, as we wrote the final script, we decided to scrap the plot involving the finances and replace it with the sequence where James discovers the drug is outdated and, due to the limited amount of liquid he has left, is given very limited time for a last interaction with Lisa. In-between, we added another character, Amy, a friendly single work-colleague of James’ and thought about ending the film with James saying his final goodbye to Lisa as the placebo drug runs out and calling Amy to ask if she would like to hang out with him. The reason was because in reality, many people who have lost their partners/spouses to certain deaths, feel the need to put their pasts behind them and moved on with life. The development process took longer than the production and post-production. One reason was because the team originally consisted of four people, but one member who was originally the Director Of Photography and Camera Operator dropped out, due to subject preferences. Another reason was because we had a difficult time casting. Keiran Rowan played the role of James and Alina Nae was cast as Lisa. We required one more cast member for the role of Amy. This was a very small role, so Matt offered local student Emma Saunders the part. She was only required for one scene where she knocks on the door and asks James how he’s feeling due to his absence from work, then offers her contact details. As a result of the DOP’s drop-out, the camera-work was shared between Matt and Michael. We used a digital DSLR to film the shots. The camera also came with a port for the boom microphone. Because I was the sound producer, my role was to hold the boom pole into position for each shot we filmed. I had to ensure the microphone was not present on-screen each time and listen for any sound errors, such as crackling noises, that occurred. In-between shooting, I recorded extra sounds, including ambience and a sound effect for a boiling kettle. In order to create a realistic sound, I filled my kettle with water and boiled it. During the process, I recorded the sound. At one time, we shot the opening scene in the cemetery and it was raining at the time. This was a hazard for the recording equipment and because is a poor conductor to electricity, we didn’t want the items to get wet in case they ceased working. So I brought an umbrella to shelter the equipment. Both Michael and myself were using the camera and microphone at the time needed to ensure the umbrella was held at a particular angle, depending where the rain and wind were blowing. This was one of the hardest processes we came across. Another part of my role was to negotiate with a music composer to write a score for the film. I was preferably seeking a score with an orchestral and synthesized sound written in a minor score, in order to create the sadness within the film. I came across Roshan Sharma who was studying an HND course in music and who I knew from a house-mate at the university. He volunteered to write the music, though because we were studying different courses at the time, it took some time for the whole score to be completed. Due to the extension we had on the Pre-Production process, we were provided very limited time to complete the film’s production and to finish the edits. As a result, I edited the footage we shot in-between shooting sessions. Each time we shot certain amounts of footage, I would upload the footage onto my hard drive and edit it via Final Cut Pro. Despite the ‘development hell’ and limited time to produce the film, I personally consider this the best film I worked on during my first year of my HND Digital Film-Making course. The reason is due to the fact it tells a more structured storyline compared to Door and From Grass To Grace. I felt the film provided an extremely emotional value to the synopsis. Placebo demonstrates how difficult it is for one to lose a close friend/relative and to cope with the loss. Added to that, death in a family may be a haunting part of one’s past, but it is important to move on with life. Three years after completion for the first edit, I re-edited my copy of Placebo. You may notice some differences between that and the original. The latest reissue is slightly longer and I thought about using a different colour format to depict the sadness within the film. The inspiration came from Schindler’s List, one of my personal favourite movies. I admired its colour format and, considering that the film was based on the Holocaust, how it contrasted with the bleak experience of seeing the Nazis torture the Jewish prisoners. Although Placebo is less bleak, I felt the black/white format would increase empathy for the main protagonist.